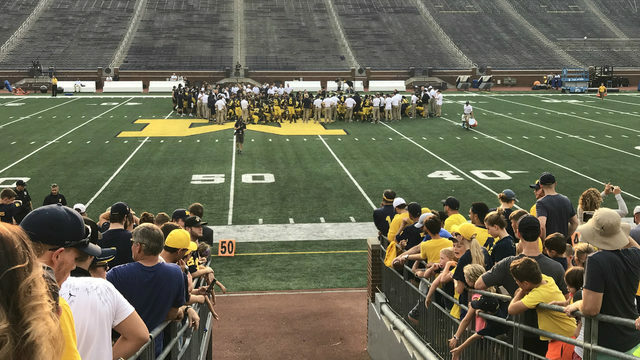 ANN ARBOR, Mich. - New Michigan offensive coordinator Josh Gattis joined head coach Jim Harbaugh on his "Attack Each Day" podcast Tuesday and talked about what fans should expect from the offense going forward. Gattis said he wants Michigan to be "explosive" on offense while not getting away from the program's foundation of running the ball and imposing its physical presence. "It's also about getting our skill players involved and having answers for what teams want to be able to do defensively," Gattis said. 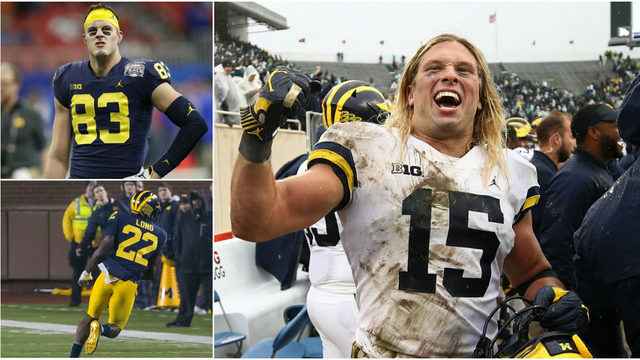 Michigan's offense sputtered down the stretch in 2018, most notably against Florida in the Peach Bowl. The Wolverines struggled to run the ball and didn't go to their talented receivers as often as many fans would have liked. "We're going to make sure that it's going to be personnel-driven," Gattis said. "We're going to get our playmakers the ball, get our speed out in space and allow our skill players to be skill players and let them be active, but also having a physical presence that, 'You know what? We're going to set the tone each and every week with the guys up front,' and everything's going to build on that. "This isn't going to be about Josh Gattis, or this isn't going to be about a new Michigan offense. This is going to be player-driven. When you look back at the core values of this program, it's going to be about hard work." Gattis said the foundation of what Michigan builds on offense will be recruiting. It hasn't been difficult for him to get into the flow at Michigan because he already has familiarity with many of the players and recruits after recruiting them at other schools. 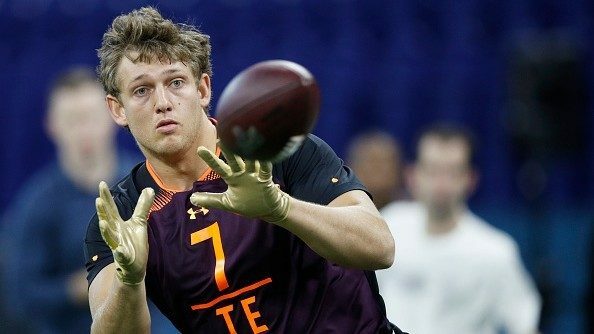 "I was walking down the hall and I saw (wide receivers) Tarik Black and Donovan Peoples-Jones, and those are two kids that I recruited very hard at previous institutions, so when you've got that relationship already and they know who you are, it kind of helps break the ice," Gattis said. During his time with Western Michigan, Vanderbilt, Penn State and Alabama, Gattis said he often found himself in recruiting battles against Michigan for the same players. He's considered one of the top recruiters in the country, but he didn't always come out on top. "We've recruited top talent (at Michigan)," Gattis said. "We've battled numerous institutions. In fact, I've been more so on the losing end of those battles than I've been on the winning end, but now I'm happy to be here because I'm going to win some battles." Gattis said he's getting back on the recruiting trail Wednesday to spread the word about Michigan's future plans. Harbaugh said it didn't take long to get Gattis out on the recruiting trail wearing the Maize and Blue. 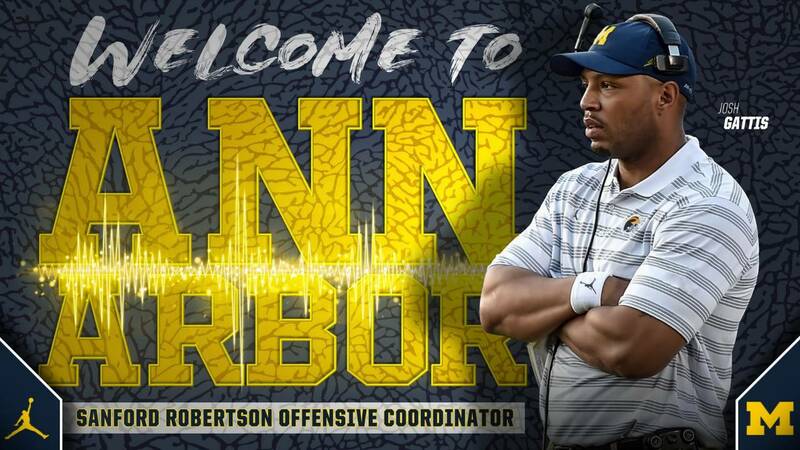 "You talk offense and he's got a vision, and he's got a plan," Harbaugh said. "It's clear. It's clean. It's precise. It paints the picture pretty fast, and we've gotten moving fast. He's detailed. He's organized, and he knows what he's doing. The good ones really make it look easy." "We're going to take the headset off him in like one minute and literally put him on a plane in the next 30 minutes (to recruit)," recruiting director Matt Dudek said. Gattis and Harbaugh said the first step for a new coach is to recruit the players who are already on the roster. Those players want to know how coaching changes will impact them personally. Then, after a relationship is built with the current players, Gattis said the next step is to find talent for the future. "I think the plan is kind of to see some of our signees who are not on campus," Gattis said. "Obviously, I've met all our mid-years. But also getting ahead on the 2020 class and getting into some areas where I already have previous relationships, whether that's being in the South or whether that's being in Pennsylvania. "I'm trying to bring as much value as I can to the organization from a recruiting standpoint. Even if that's helping tag along to help recruit someone -- maybe it's a running back, maybe it's a tight end, a different position player. You know, overall, overseeing the whole offense and making sure we're recruiting the best student athletes we can for the University of Michigan, and that's my goal. "I don't care where they send me -- cars, planes, trains, automobiles -- whatever it may be. I'll walk out there in the snow if I've got to go see a guy. But we're going to make sure not only are we coaching our offensive players to be at the highest level, but we're recruiting at the highest level, because that's what's going to lead to our success." Harbaugh said he and Gattis have similar philosophies, so he feels comfortable giving him control of the offense. "Yeah, started to think about that and just the analogy of getting the right people on the bus," Harbaugh said. "We've had some coaches depart and looked at that as an opportunity for our football team to grow and make ourselves better, so that's really what it's been. I've watched Josh long enough to know -- and we've talked and have the same philosophy, really, which I liked -- but I like the idea of him running it. So we have some very fine offensive coaches here, no question about that, and they feel like, 'Yeah, let's go. This is the direction we're going, so let's go and let's make it great. Let's make it work.'"